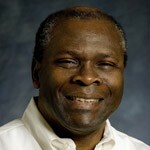 Sam Jenekhe, Professor of Chemistry and Boeing-Martin Professor of Chemical Engineering, is the recipient of the 2014 Charles M. A. Stine Award from the American Institute of Chemical Engineers (AIChE). The award recognizes Professor Jenekhe for outstanding and pioneering contributions to the development of semiconducting polymers for applications in organic electronics and optoelectronics. The award is given annually to a leading researcher in recognition of outstanding contributions to the field of materials science and engineering and is sponsored by E. I. duPont de Nemours & Co. Professor Jenekhe will present the keynote talk in the MESD Plenary Session at the 2014 AIChE Annual Meeting in Atlanta. More information on the Charles M. A. Stine award can be found here. For more information about Professor Jenekhe and his research, please visit his faculty page.